14.00: -3,7 C, 15 m/s from 325 true, 933.8 mb, no surface contrast, no horizon, visibility 50 m, overcast, snow, strong drift. 24.00: -3.2 C, 7 m/s from 265 true, 936,7 mb, surface contrast good, horizon good, visibility to horizon, 3/8 overcast towards south. During the day everybody has been hanging out in the kitchen telt. 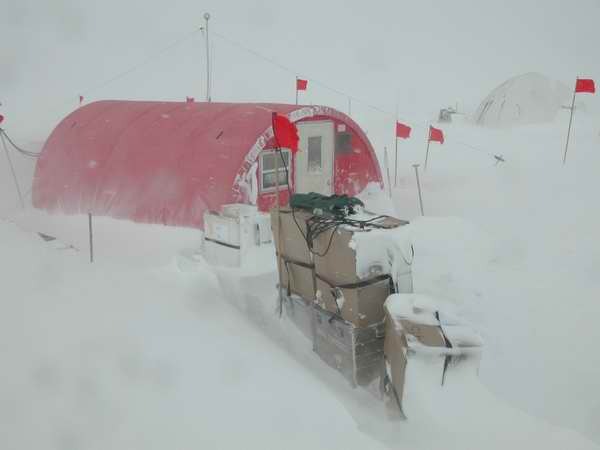 Once every hour we had to go out to check the generator so that it was not covered in drifting snow. We also had to check that the tents were not destroyed by the strong winds. Furthermore there was a huge pile of drifting snow in front of the kitchendoor (which is opened outwards). Therefore we had to dig the snow away every half hour in order to be able to open the door. However, we managed to get some work done, too, like kitchen duties. Steffen made gullash and mashed potatoes for lunch and he even mad dinner as well: Beef with green peas and rice. In the drill tent we finally got started with some measurements. We measured yesterday's production. Tomorrow we will start early in the morning to take advantage of the good weather. The Kansas group has analyzed their data and it seems like some of their profiles has to be remeasured, if there is time. Today we have been in contact with Copenhagen, Station Nord and VECO over the Iridium phone.